Cantatrice began back in 2004 when 90 singers signed up (yes 90!) on the first day. Its sister choir in Horsham began three months later. St Clement Danes in the Strand, London. ​Workshops by visiting professionals are a must for any choir who want to improve and David Lawrence, Brenda Rattray, Jeremy Jackman, Jonathan Wilcocks were musicians we invited to work with Cantatrice.. They loved the energy, happiness and over-whelming sound of the choir and of course lunch at White’s! 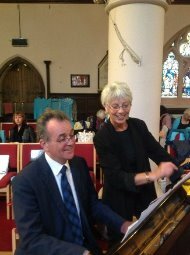 Also arranged were Voicecraft workshops with Mark Oldman and Ruth Kerr, a must for any choir who want to learn the basics of singing when time does not always allow because of note bashing! We love working with young musicians which are plentiful and willing in our area; many of whom have gone on to music colleges and who have returned to share in some more music making. Over the years- apart from the social events (!) and the usual Christmas celebrations, the choir has performed with Worthing Symphony Orchestra at Worthing Assembly Hall in the ‘Last Night of the Proms’ concert, for the 25th anniversary celebrations for ABCD (Association of British Choral Directors) at the Dorking Halls in October , returning there again for Ch oiroke – a massed choir sing masterminded by the charismatic Kaytie Harding. We took a trip to the Mid-Soomerset and Bournemouth festivas, sang with the Sussex Harmonisers in Horsham’s Drill Hall, and performed a concert for the Steyning Festival but probably the biggest challenge and highlight was our concert in St Clement Danes Church, the Strand, London as part of the ever growing Brandenburg Choral Festival. Finally one could not have any choir without an accompanist and Laura Skuce was my absolute rock when it comes to support. A totally versatile musician, happy to play (& sing) classical, rock, folk & musicals and turn her hand to almost any instrument! Sadly we lost her in 2013. The Choir is now accompanied by Zoe's husband Gary Prior who adds a new dimension and personality to this happy choir..
​Zoë was born in Steyning and trained at Chichester College (where she met her husband) Trinity College of Music, where she was awarded the Lady Maud Warrender Prize for outstanding achievements in singing and musicianship, and the Else Mayer Lismann Opera Workshop. Having sung professionally for several years she fell into conducting in 2002. She now directs Cantatrice, the Kaleidoscope Singers and the mens group Vocal Fusion Acapella. Cantatrice were heard on Meet the Choir on Sunday 28 September 2014 at 4.30pm. This was a very special airing as it followed our 10th Anniversary celebrations and it was the last time that Laura played for us, so even more memorable and special. Our sincere thanks to Jose Peate (Zoe's mum) and Kirsty Watson for being brave enough to speak - you were brilliant!